If you don’t already know why we have European starlings here in the United States, it’s because in 1890 someone wanting to make European settlers feel at home released 60 European starlings (along with birds of all the other species mentioned in Shakespeare) in Central Park. They released 40 more the following year. While the other transplanted species soon perished, the resourceful, adaptable starlings spread throughout the continent within a few decades. They continue to flourish today, sometimes causing conflicts with homeowners who then look for ways to get rid of starlings. Putting out seed and water for our native songbirds is a national pastime. But by leaving food out, we also unwittingly invite starlings and other non-native birds (such as house sparrows) into our yards—and homes. Open dumpsters and trash left at the curb in plastic bags can also attract starlings, as can sheltering opportunities. In the suburbs, almost every home has multiple exhaust vents that make ideal nest sites for these cavity-nesting birds. Starlings may also make use of housing we put out for our native cavity nesters, like purple martins. In addition, starlings may become noisy and messy when they roost in large numbers. These conflicts can be solved, though, so don’t despair! Vents: Eliminating places for starlings to nest in and around your home helps reduce their numbers in your area, which, in turn, reduces conflicts. Furthermore, preventing problems before they occur is always preferable. So the first thing you should do is make note of unscreened exterior vents and openings around your home. 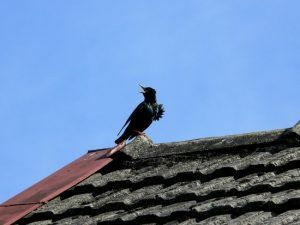 Bathroom, stove, and dryer exhaust vents are most commonly used by starlings to nest, but openings in soffit panels and soffit vents are also used. Also be careful not to overlook vents with flaps or louvers too, as they can easily be defeated by starlings. The next step is to check to see if the vents are already occupied. 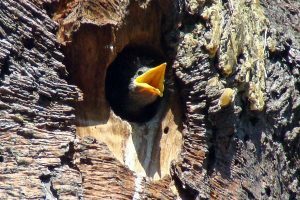 If you haven’t noticed scratching, flapping, or chirping in a vent or grass and twigs sticking out, then you might be surprised to discover during your inspection that a nest is already in progress. Unless there is a safety concern, let the nest run its course. The eggs will take about 12 days to hatch, and the chicks will take about 3 weeks to fledge. Once they leave, clean the nesting material out of the vent and cover it right away because starlings nest several times a season. If you’re unable to clear out all of the nesting material from dryer and stove vents in particular, cover the vent temporarily and hire a duct cleaning company to do the rest. If the vents are clear, you can measure them and head for the hardware store. For many types of vents you’ll find ready-made commercial vent guards that can be easily removed for cleaning (think dryer lint). 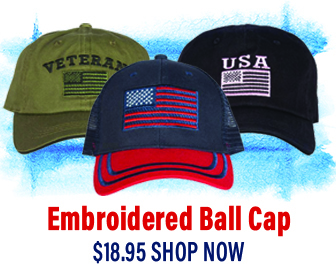 For exhaust vents that may be large or not of a standard size or shape, purchase hardware cloth with ½” openings and firmly secure it to your house, ideally behind the vent’s louvers. Trash: Secure trash in trashcans with lids, rather than just in plastic bags. If you have a dumpster at your apartment or place of work, ask all who use it to keep the lid closed. Purple martin housing: If you really don’t want to attract starlings, it’s best to either take down your purple martin house or cover the openings between nesting seasons. Don’t put the house back up or uncover the openings until you see that the martins, who are native cavity nesters, arrive in your area for the nesting season. Otherwise, starlings (who stay around all year) will occupy the housing before the martins return. Once a good number of martins arrive, they can usually work together to fend off starlings. Large roosts: There are a variety of auditory and visual scare devices on the market that can keep starlings from roosting in certain areas. You can also try hanging pie tins or reflective tape in areas you want them to leave. Spraying them with water, banging metal tins or pans together, or yelling at them may also work. Vary and combine techniques, and be persistent. 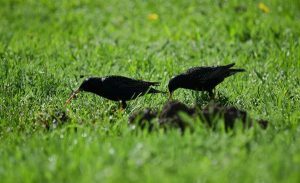 If starlings roost in large numbers and leave excessive quantities of droppings below, you may be concerned about histoplasmosis. 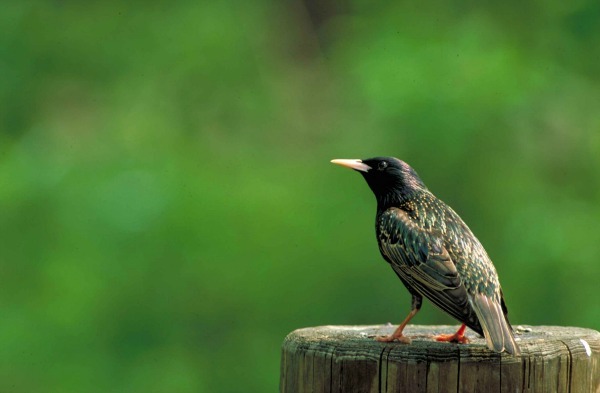 Histoplasmosis is a fungus that grows in soil when starling droppings pile up. Because the spores can become airborne during removal of the droppings, and respiratory disease can result if the spores are inhaled, it is important to follow recommendations outlined by the Centers for Disease Control when removing starling droppings. Never shovel or sweep dry, dusty droppings. Spray with water first to reduce the amount of dust that can become aerosolized during collection for disposal. For the rest of the pertinent safety guidelines, please visit CDC.